The deadline for filing Form GSTR-3B for the duration between July, 2017 to February, 2019/quarters July, 2017 to December, 2018 has been extended to the 31st of March 2019. No late fee is imposed on candidates who file Form GSTR-3B (applicable for the duration between July, 2017 and September, 2018) between the 22nd of December 2018 to the 31st of March 2019. Recipients may avail the ITC related to invoices that have been issued by suppliers during the financial year 2017-2018, until the due date for submitting Form GSTR-3B for March, 2019. This is only applicable for those recipients who are eligible to avail ITC. Dates associated with the GSTR-3B. Prerequisites for filing the GSTR-3B. The GSTR-3B is a consolidated summary return of inward and outward supplies that the Government of India has introduced as a way to relax the requirements for businesses that have recently transitioned to GST. Since a lot of small and medium businesses have been using manual accounting methods, filing returns within the July 2017 deadlines would be difficult for many of these businesses. Hence, from July 2017 to June 2018, tax payments will be based on a simple return called the GSTR-3B. The GSTR-3B for a particular month should be filed by the 20th of the following month. For example, GSTR-3B for July should be filed by the 20th of August, and the GSTR-3B for the month of August should be filed by the 20th of September and so on. This deadline applies to every month till June 2018. The GSTR-3B form should be submitted by any business that is liable to file the monthly returns GSTR1, GSTR-2 and GSTR-3. The GSTR-3B form can be easily filed online through the GSTN portal. The tax payable can be paid through challans in banks or online payment. You either need an OTP from your registered phone to verify your return using an EVC (electronic verification code) or a digital signature certificate (of class 2 or higher). You can also file your GST returns using an Aadhar based e-sign. Sales supplies (Zero rated supplies - includes items and services that are exported by you overseas, deemed exports or those sold to SEZ units or developers). Sales supplies (other than zero rated, nil rated and exempted - includes all regular taxable sale of items and services made by you). Purchase supplies liable for reverse charge (purchase transactions where you are liable to pay the tax directly to the government on behalf of your supplier who may or may not be registered under GST). Cess is applicable to certain industries such as automobiles and tobacco. If your business is not involved in selling such goods, there’s no need to enter cess-related details. Supplies made to unregistered people (includes unregistered businesses and end consumers). Supplies made to Composition Taxable people (registered businesses who have opted for the composition scheme). Any specialized agency related to the United Nations Organization. Consulates or embassies of foreign countries. Multilateral Financial Institutions or Organizations included under the United Nations Organizations Privileges and Immunities Act of 1947. Any person or group of people who have been designated by the Commissioner to receive a UIN. (A) ITC available (whether in full or part): Enter the tax amounts related to import of goods (1), import of services (2), inward supplies liable for reverse charge (3), inward supplies from Input Service Distributors (4), and all other ITC (5) that is not included under subsections (1) and (2) of section 4A. (B) ITC Reversed (per rules 42 and 43 of CGST rules): Under this you will have to furnish details of capital goods/services that have been utilised for non-business purposes. The ITC against such items and services will be made unavailable to you since legally, you can only claim ITC on taxable goods and services by selling them or for business purposes. © Net ITC available: Calculate this by subtracting the reversed ITC (B) from the available ITC (A). (D) Ineligible ITC (per section 17(5) and others): This includes blocked credits, which occur when certain services are involved. You are not allowed to claim ITC on transportation services (if they’re not for the purpose of supplying goods), food, health services, cab services for employees, and beauty services by default. 5. 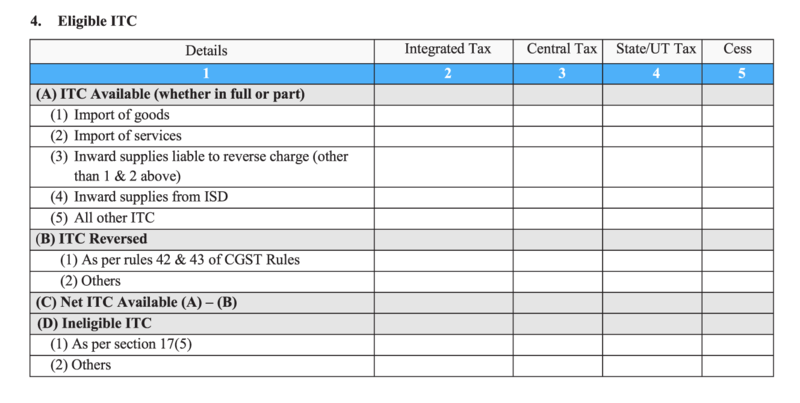 Values of exempt, nil-rated, and non-GST inward supplies: Under this sub-section, the taxpayer should enter taxation details for inter-state and intra-state purchases made. This includes supplies purchased from a supplier under the Composition Scheme, purchase of items and/or services that are either exempt from GST (they attract 0% GST but you as a taxpayer cannot get a refund of tax paid on inputs), nil-rated (attract 0% GST by default but allows you to claim refunds of tax paid on inputs used to effect them) or non-GST supplies (items that do not come under the purview of GST and may instead attract state VAT under the old system). 5.1. Interest and Late fee payable: This may apply to only those businesses who have some additional tax liabilities imposed on them (this may arise whenever they fail to comply with one or more GST regulations). If this applies to you, then you are to declare the aggregate amount of interest and/or late fee applicable on taxable supplies that may or may not attract tax on reverse charge under different tax heads (IGST, CGST, SGST/UTGST and Cess). 6. Payment of tax: You have to pay the GST you owe to the government before filling up this section since, it captures the overall tax amounts paid for CGST, SGST, IGST, and cess. Include the overall tax payable, tax paid through ITC (by offsetting the amount paid on inputs as tax), tax paid with respect to TDS/TCS credits, and tax/cess that was paid in cash (this also includes those amounts paid as interest and late fee). 7. TDS/TCS credit: Whenever a customer or an e-commerce deducts or collects tax at source, then you receive credit against it. If you have accumulated such credits during this month, (also known as TDS/TCS credits) they are captured under this section under different tax heads (IGST, CGST, SGST/UTGST). After filling in all these details, the GSTR-3B form can be submitted after being signed by the authorized taxpayer.